John F. Carberry is a Principal in Cummings & Lockwood's Litigation Group and is based in the Stamford office. 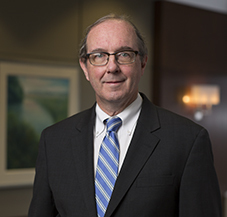 John has over a quarter century of experience representing creditors in state and federal courts, including bankruptcy court. He serves as a Special Master, Attorney Trial Referee, Arbitrator and Fact Finder for the Connecticut Superior Court in Stamford. John also serves as the Firm's General Counsel, Loss Prevention Partner and Pro Bono Partner.